English – The Language of Global Business? English will become even more important as the global language of business, according to a new study. With China’s growing economic might, is Mandarin becoming the preferred language of business? Not anytime soon, says a newly released study. Instead, English will maintain and grow its dominance, moving from “a marker of the elite” in years past to “a basic skill needed for the entire workforce, in the same way that literacy has been transformed in the last two centuries from an elite privilege into a basic requirement for informed citizenship.” (Indeed, the British Council reports that by 2020, two billion people will be studying English.) The new study of 1.6 million online test-takers in more than 50 countries was conducted by EF Education First, a company that – it should be noted – specializes in English language training. The ability to speak a second (or third) language is clearly important for becoming a global leader, as I’ve previously written. But – for better or worse – it seems that English may be the most essential language for global business success at the moment. Indeed, even in powerhouse China, more people are currently studying English than in any other country. An incredible 100,000 native English speakers are currently teaching there. Here are the most intriguing takeaways from EF’s study, which have potential implications for future global development. Women speak better English than men – in almost every country worldwide. Increasing numbers of women are attending college, and they’re often over-represented in humanities classes compared to men. The net result? Women are speaking better English, and may find themselves well positioned to succeed in the global economy. International sectors use English, and local sectors don’t. If someone works in travel and tourism, for an international consulting firm, or in telecom, there’s a good chance they speak English. For instance, the Finnish telecom concern Nokia and the German business software company SAP both use English as their official language. In retail, not so much (which is why it’s so devilishly hard to communicate with shop clerks while traveling). European countries speak great English, Asian countries are in the middle, and everyone else lags. English speakers: do you ever get the sense that Scandinavians speak better English than you do? You’re probably right (as evinced by my attempt, years ago, to order an ice cream in Norwegian from a teenage streetcart vendor in Oslo, only to have him fire back – in perfect English – that I “probably ought to stick to English”). Scandinavians and the Dutch are the English-as-a-Second-Language superstars; as you move south through Europe, rates of proficiency decline but are still good. Asian countries, led by Singapore and Malaysia, scored solidly in the middle rung. And if you’re planning to visit Panama, Saudi Arabia, Thailand, or Libya, which bring up the rear, make sure you have your Google Translate app with you. The hegemony of English is no excuse for monolingual native speakers to slack off (as I’ve written about here). But at least we’ll know, as we struggle to write our “adorable” emails in a foreign tongue, that our global colleagues will be making the same effort in reverse – and hopefully, in the end, we’ll all understand each other a bit better. Dorie Clark is CEO of Clark Strategic Communications and the author of the forthcoming Reinventing You: Define Your Brand, Imagine Your Future (Harvard Business Review Press, 2013). She is a strategy consultant who has worked with clients including Google, Yale University, and the Ford Foundation. Riding the waves of a $573 million 2010 positive trade balance in U.S.recreational boats, the venerable Chris-Craft moniker now graces a line of redesigned luxury speed boats, perfect for jet setters in the U.S. and abroad. Like other heritage brands, those classic out-of-favor product lines that instill profound loyalties and deep resonance in consumers’ psyches, Chris-Craft has risen from the boneyard of broken brands, thanks to the business acumen of its current owners and the global appeal of its vessels. Of the roughly 600 boats it produces annually, approximately 25 percent grace sparkling lakes and seas outside the U.S.
Stephen Julius, chairman of Stellican Ltd, which acquired Chris-Craft in 2001. According to Steve Callahan, Chris-Craft’s vice president of materials, Sweden, the Czech Republic, Turkey and Australia are the firm’s top export markets. The Balkans, Singapore, New Zealand, Hong Kong and Brazil are bright spots, with France, South Africa and Spain coming on strong. Reaching the high net worth yachtsman involves deft dealer leadership, word of mouth, reputation and the simple act of a potential buyer seeing a Chris-Craft boat aboard another ship. Resurrecting a fallen brand? That takes a measure of grit. 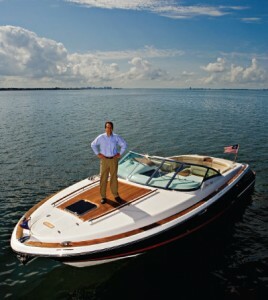 Following their practice of picking through legendary brands that suffered through forgettable years to find a gem or two, the owners of the risen boat maker, Stellican Ltd’s chairman Stephen Julius and chief executive officer Stephen Heese, have found a niche in an industry that evokes upscale leisure wrapped in the all-American red, white and blue spirit of innovation. Working their magic of capital infusion, high craftsmanship and premium prices, the duo court the ultra rich who can plunk down $225,000 on a tender—a small boat towed or carried by a yacht for short jaunts or going ashore when the yacht is anchored. Understanding how a speed boat like Chris-Craft’s Corsair 36 European edition belongs on a mega yacht requires a peek at the boat maker’s storied history and an appreciation of how two Harvard Business School grads, Julius and Heese, had the finesse to make it happen. Julius formed Stellican Ltd as a private equity firm in 1991, primarily to mind his family’s money but also to acquire and fix out-of-favor iconic brands. Heese joined his former classmate in 2001 to captain the Chris-Craft turnaround after selling his stake in a global construction products company. Through the partnership, Julius has provided working capital and an artist’s aesthetic; Heese adds an accountant’s analytical scrutiny and manufacturing muscle. Simply put, their partnership involves the ABCs of business turnarounds: Acquire an authentic brand, Burnish it, and Cadge a tidy profit, hopefully north of 35 percent. Crafting a Legacy Early chris-craft in production. (middle) Founder christopher columbus smith had established a reputation as a great boat maker by the 1890s. The two partners tested their sea legs before the Christ-Craft adventure. Julius had acquired and successfully turned around Riva, the beleaguered, upscale Italian marine titan, in 1998. Heese, with global business experience, is a lifelong sailor who grew up a shell’s throw from Chris-Craft’s manufacturing facility near Sarasota, Florida. The Riva saga was a template for the Chris-Craft deal. In it, la famiglia Riva ceded control of the business to outsiders in 1969, subsequently changing hands several times until Rolls-Royce took over. After losing boatloads of money on Riva, the British automaker unloaded it on Stellican in a quickie deal. Julius revived Riva with a redesigned line of boats that evoked in customers la dolce vita’s vibe of the 1960s Riva Aquarama runabout. The ABC formula worked. Ferretti Yachts, Italy’s largest yacht maker, acquired Riva from Stellican Ltd in 2000. 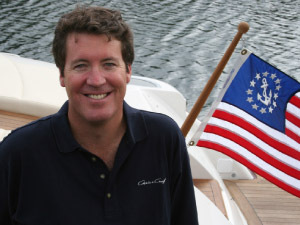 That transaction prepared Stellican for Chris-Craft’s complicated rescue from bankruptcy in 2001, which involved acquiring the trademark and an inventory of 130 finished and unfinished boats in separate transactions. Stellican Ltd reportedly paid $5 million each for the brand name and the assets. “Chris-Craft was a fantastic brand with decades of forgettable years, plus it met our skill sets,” Heese says. Chris-Craft’s rise and fall follows the story line of a great brand gone south. In 1874, 13-year-old Christopher Columbus Smith built a fast and durable skiff for duck hunting on Michigan’s Lake St. Clair. Other Great Lakes boaters liked his swift, sturdy runabouts and his reputation was established by the 1890s, burnished later by five straight Gold Cup speedboat racing victories. 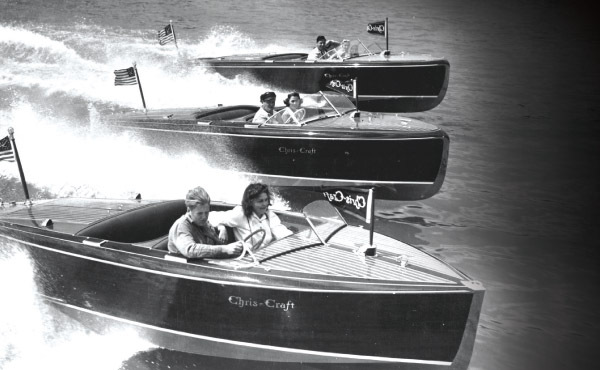 For the next seven decades, Chris-Craft’s scrupulously detailed boats, with their mahogany and brass fixtures and racing heritage, drew celebrities, racers and pleasure boaters until the 1960s, when fiberglass boats and other innovations caught customers’ eyes and stole market share. Chris-Craft sales sank. Eleven straight years of losses put the company at low ebb in the late 1990s. The Chris-Craft magic that made for a penultimate U.S. lake boat has now been extended to a brand with global reach. “Our sweet spot is a 24- to 26-foot boat for the owner here or overseas who will spend $225,000 on a Chris-Craft rather than $120,000 for an ordinary boat of the same size,” says Heese. Chris-Craft’s global product line, exemplified by the Corsair 36 European edition, adds features that appeal to customers outside North America. They include extended teak or mahogany panels, large windshields, oversized sunbathing platforms, wet bars and customized color schemes. “Europeans prefer a larger sun pad and a smaller cockpit than Americans, who like large areas to entertain friends on their boats,” Heese explains. There are other nice features. Any first mate who has struggled converting the dining table to a storage or sleeping area would give his yachtsman’s flag for the Corsair’s electric table that rises from the floor to cocktail or dining height at the push of a button. When boaters are finished using the table it lowers electronically into the floor. Other upscale boats may have this feature, but Chris-Craft’s combination of design, materials and performance takes aim at the cognoscenti’s hearts and wallets. Customizing a boat for exacting buyers requires a balancing act between not disrupting factory production in Florida, yet having the flexibility of adding a second refrigerator, fold-down windshield or making a silver-metallic finish for an overseas buyer. Chris-Craft’s challenge of designing and producing great boats is coupled with finding a smart way to sell those vessels to affluent boaters who have a smorgasbord of spectacular boats from which to choose. To that end, the company’s top guns have built a nexus of 80 dealers worldwide by networking at major boat shows and knocking on doors of well-known dealers in prime boating locations. While each dealer adapts its sales approach to local tastes, common ingredients make a heady mix. Dealerships at upscale locations such as South Africa’s Broderick Marine at the Riviera-on-Vaal Hotel, Australia’s Premier Marine on Rose Bay or France’s Proyachting at chic Evian les bains beckon the wealthy. Photos of sunbathing babes on deck, images of Chris-Craft boats skimming turquoise seas and the promise of exquisite service sure don’t hurt the sale. To seal the deal, potential buyers get to see and touch the boats. “We encourage dealers to buy three or four boats for display in their showrooms,” says Heese. The dealers’ desire for potential customers to be hands-on with Chris-Craft boats translates to locating nearby destinations where boaters spend the most time on the water, the better to service persnickety clients and their expensive toys. Additionally, Julius and Heese invite all dealers to Chris-Craft headquarters once a year for an intense three-day meeting. New models are introduced, new designs discussed, focus groups are held to discuss customer wants and exporting and marketing strategies are bandied about. Once a boat is sold and ready to leave the factory, the materials team steps in to prepare it for travel to Chris-Craft’s far-flung dealers. “All loose items inside the boat such as mattresses, cushions and covers are either stowed in storage areas or packaged with strapping tape,” says Steve Callahan. “There’s also foam packing on the windshield and other protruding components. 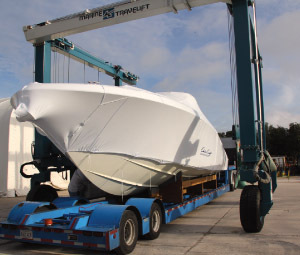 We then put a transhield, which is a transport cover that is heated and then fitted to the boat’s contours, to prevent ‘road rash’ caused by rocks and dirt hitting the boat.” Nestled in a cradle, the boat is then loaded on a transport trailer for delivery to one of four U.S. ports: Jacksonville or Miami, Florida, or Savannah or Brunswick, Georgia. The boat, strapped to its transport cradle, is then hoisted on the ocean freighter. A Chris-Craft wrapped for its overseas journey. Chris-Craft’s freight-forwarder, Peters & May, global boat transporters headquartered in the U.K., then handles the details of shipping the boat overseas. Through its Chicago office, the marine logistics experts prepare necessary documents including a dock receipt, booking confirmations, bill of lading and customs documentation. Vital pieces of data include the freight originator, U.S. port and terminal location and phone numbers, trucker information, ports of departure and discharge, dates of shipment and arrival, bill of lading reference numbers and the hull ID. 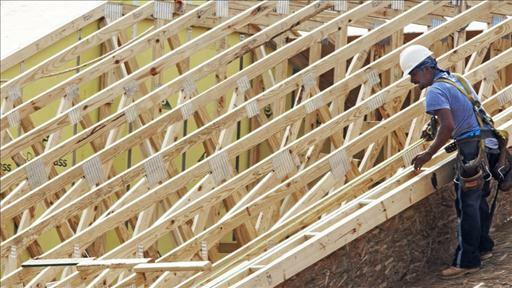 Peters & May also ensures that the shipment adheres to the destination country’s regulations. For example, Australia requires that the transport cradle be fumigated. Like other exporters of big ticket items, Chris-Craft has experienced turbulence caused by 2008’s global financial meltdown. The company turned a profit in 2002 on revenues of $30 million, jumped to $50 million in 2006 and to $60 million in 2008. Buyers for the company came courting until the global economy “entered a death spiral,” as Heese puts it. Revenues dropped to $30 million in 2010 but rebounded to $40 million in 2011, still short of Stellican’s profit target. The partners continue to have high hopes for their aspirational brand, and that strong demand for U.S. marine products overseas (see sidebar) will help them eventually reach their ROI goal. Unlike its two successful executions of the ABC strategy—Riva’s two-year turnaround and the resurgence of Indian Motorcycles in less than five years—Chris-Craft is a long-term labor of love. Part of that decision goes beyond professional to personal. Heese, who grew up and sailed the waters of his native Florida, is happy to have returned home with his family to co-pilot a line of boats with an extraordinary lineage. ONE by one they came to the stage and pitched their ideas to the crowd. There was the founder of Kwelia.com, which makes software that helps landlords mint more money from their properties. There was the co-founder of Chef Surfing, an online service for people looking to hire chefs, and for culinary wizards keen to tout their skills. And the creator of Kedzoh, which has an app that lets firms send short training videos to workers via their mobile phones or tablet computers. These and other start-ups, some sporting fashionably weird names such as Chu Shu, Wallwisher and IguanaBee, won rapturous applause from the entrepreneurs and venture capitalists in the audience. To your correspondent, who is based in Silicon Valley, it all felt very familiar. Yet this scene took place in Chile, a nation better known for copper-mining and cheap wine than for innovation. Many countries have sought to create their own versions of Silicon Valley. Nearly all have failed. Yet Chile’s attempt is interesting because it exploits the original Silicon Valley’s weak spot—America’s awful immigration system. 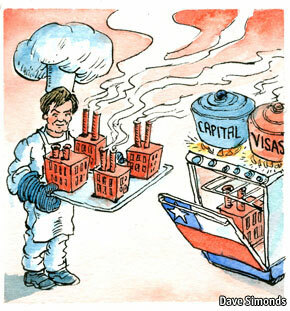 When the home of free enterprise turns away entrepreneurs, Chile welcomes them. 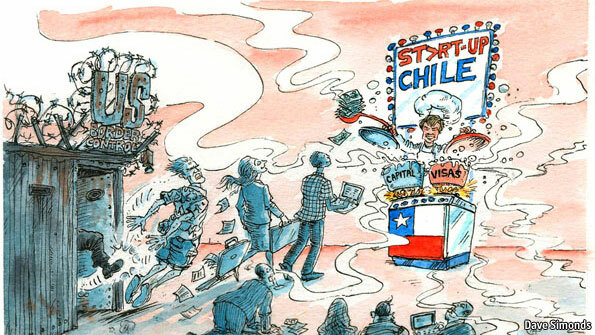 “Start-Up Chile” is the brainchild of Nicolas Shea, a Chilean businessman who had a brief stint in government. The programme selects promising young firms and gives their founders the equivalent of $40,000 and a year’s visa to come and work on their ideas in Chile. Since 2010, when Start-Up Chile started, some 500 companies and almost 900 entrepreneurs from a total of 37 countries have taken part. 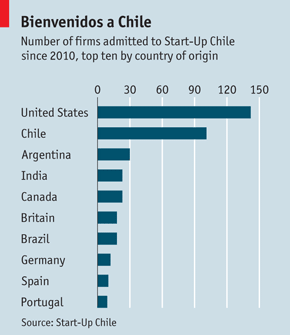 Start-Up Chile has doled out money to Chileans, too (see chart). Like several other countries, including Brazil and Mexico, Chile wants to establish itself as the entrepreneurial hub of Latin America. It has launched government-funded seed-capital programmes to back local start-ups and made it easier to set up a new company swiftly. Via Start-Up Chile it has also been importing foreign entrepreneurs, in the hope that they will inspire homegrown ones. The programme has been a big hit with foreigners, which is hardly surprising: they get to build their businesses with Chilean taxpayers’ pesos without having to give up any equity. Many rave about their time in the country, where they can write software code while sipping Pisco Sours (a favourite local tipple) and swapping tips with their peers. “The vibe is very Californian here,” says John Njoku, an American who is the founder of Kwelia. Companies have used their cash for all manner of purposes. TOHL, a start-up that produces flexible piping that can be deployed from helicopters to distribute water in difficult-to-reach areas or disaster zones, says it has spent the money on things such as testing its new system with a Chilean mining company and acquiring a patent. Start-Up Chile aims to have backed 1,000 fledgling firms by the end of next year, at a cost of $40m. It has already sired some successes such as CruiseWise, an online cruise-booking service, that have gone on to raise capital from other sources. However, it should really be judged by the two yardsticks Chile’s government set for it. Has it raised Chile’s profile abroad as a hub for enterprise? And has it inspired Chileans to start their own businesses? Judged against the first of these yardsticks, the programme has undoubtedly been a success. Its current executive director, Horacio Melo, and his colleagues regularly criss-cross the globe holding meetings to encourage entrepreneurs to come to “Chilecon Valley”, as the start-up hub has inevitably been dubbed. Start-ups from some 60 countries applied for the latest round of grants. Chile’s experiment has spurred interest elsewhere: Brazil is planning to launch a similar programme to attract foreign talent to its shores later this year. “The public-relations part of Start-Up Chile has been much more successful than even we dreamed,” gushes Juan Andrés Fontaine, a former economy minister who gave a green light to Mr Shea’s idea. Gauging the programme’s impact on Chile’s entrepreneurial ecosystem is somewhat trickier, but it appears to have had a positive effect. In return for the cash they receive, foreigners are expected to share their know-how by, for instance, coaching local entrepreneurs and speaking at events. Between 2010 and September 2012, Start-Up Chile participants held almost 380 meetings and took part in more than 1,000 workshops and conferences. Pablo Longueira, Chile’s current economy minister, reckons that Start-Up Chile has helped to drive broader changes, such as a big increase over the past couple of years in the number of Chilean firms applying to other seed-capital funds run by the government, as well as a rise in the number of universities that teach students about enterprise. (The Catholic University of Chile, for instance, plans to open an innovation centre to enable academics and entrepreneurs to work side by side.) Mr Longueira also notes that Start-Up Chile has provided plenty of material for Chilean newspapers, which now devote far more space than before to entrepreneurs and their doings. Since Start-Up Chile opened its coffers to locals, it has inspired plenty of them to try to turn their wacky ideas into businesses. Almost 40% of the most recent round of applications were from Chilean firms. Chileans who have been backed by Start-Up Chile say they have benefited from rubbing shoulders with foreign peers. “A Brazilian on the programme did all of our web development,” says Nicolas Martelanz, the boss of Motion Displays, a Chilean start-up whose software helps retailers boost revenues by putting more information at salespeople’s fingertips. Other Chileans who have taken part rave about the contacts they have made thanks to Start-Up Chile. Not everything is cool in Chile, however. Local entrepreneurs—and foreign ones who might consider staying on after their time on the Start-Up project—face tough challenges. There are not enough private venture capitalists to support young firms with money and advice. Nor do Chile’s universities spawn start-ups nearly as fast as America’s do. Many ambitious start-ups in Chilecon Valley hope to graduate some day to Silicon Valley. Another barrier to creating a vibrant start-up culture is Chile’s harsh bankruptcy regime, which makes it hard for those who fail to start afresh. Also, the economy is dominated by a few vast business empires and an extremely conservative bureaucracy. Ironically, this is threatening to stifle a peer-to-peer lending business that Mr Shea, Start-Up Chile’s founding father, recently launched. There are some signs that things could change for the better. For instance, a bill that will dramatically improve Chile’s bankruptcy regime is wending its way through the legislative process. Mr Longueira is optimistic that it will pass by the end of the year. But Chile will still find it tough to match Brazil, which boasts a massive domestic market and a more developed venture-capital industry. Brazil’s bureaucracy may be worse than Chile’s, but its economy is more entrepreneurial and ten times bigger. Hernan Cheyre, the boss of CORFO, a government body that oversees Start-Up Chile and other initiatives to support entrepreneurs, argues that while Brazil will inevitably be seen as the China of Latin America given its size, Chile can become the region’s Singapore, which has prospered by welcoming foreign talent and providing businesses with a stable, well-regulated base for their operations throughout Asia. Singapore, however, has a long track record. Start-Up Chile is only two years old, and it is closely identified with the current centre-right government, which may be turfed out at the polls next year. A new government could axe it. Whichever party wins, José Miguel Musalem of Aurus, a Chilean venture-capital firm, says he hopes that Start-Up Chile survives. It has already delivered one hefty benefit, he says: “Chileans have seen what smart graduates of Stanford and other leading universities can do, and said to themselves: ‘Hey, I could do that too’.” If Start-Up Chile spurs locals to think big, that would be no small achievement. Satgate UAB of Vilnius, Lithuania announced today that it selected Broad Street Capital Group as its exclusive financial advisor for development of a state-of-the-art data center in the Baltic States. The proposed $60 million project called Amber Core DC will launch in November and will be financed through a combination of owner and investor equity, combined with senior debt from commercial banks and U.S. export trade finance. 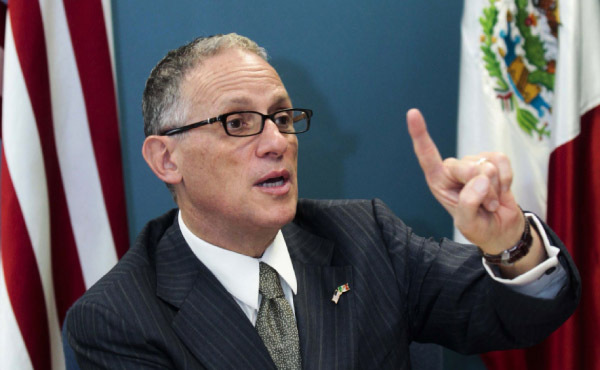 Making Cents Ex-Im chairman Fred Hochberg says the agency turns a profit in its role as lender of last resort for small- to mid-sized exporters. One day last June, Ray Zuckerman, chief executive of Serverlift, a Phoenix-based manufacturer of transportation systems for data center servers, received confirmation he’d obtained a $250,000 insurance policy requested from the Export-Import Bank of the United States. The terms included both a policy quotation and credit approvals for two buyers—one in Turkey, the other in Ireland. It covered up to $300,000 within five business days. The Arizona manufacturer turned out to be the thousandth new small-business user of the agency’s products, joining the ranks through a new program called Express Insurance. Being able to tout the satisfaction of a small company—Serverlift’s estimated sales were under $3 million last year—was a plus for the agency, whose reputation for servicing big corporations had become an albatross that nearly led to its demise in political infighting earlier this year. Last spring, as the deadline for re-chartering the bank approached, normally business-friendly conservatives focused on the bank’s deal-making—and the fact that large corporations, in particular Boeing—seemed to benefit disproportionately. As the vote to re-charter Ex-Im ticked down to the last minute, ironically it was the Democrats who mustered support to keep it going. In the 11th hour the agency was re-chartered for another two years. Having come within a hair of obliteration, the bank’s new lease on life brought about some significant changes. Reflecting the level of support it holds in the White House, the agency survived its legislative battle not only intact but expanded; the amount of capital it was permitted to deploy was increased 40 percent. The remarkable increase in the finance cap provided the agency with another $40 billion to play with, extending its footprint to $140 billion. Its battle for survival over—at least for the next two years—the agency returned to the daily business of encouraging companies to export and providing the services it contends fill in the crucial gap between what exporters need and what commercial lenders are willing to offer. Ex-Im offers three basic financial products to exporters: loans to overseas buyers of U.S. goods , loan guarantees for overseas sales offered to private U.S. lenders and loan insurance offered directly to exporters. 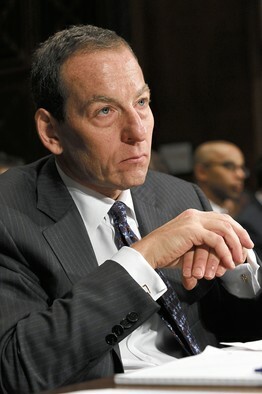 Hochberg, who inherited the Lillian Vernon mail order company from his mother and ran it for some years before taking it public, suggests that the fear of not getting paid by overseas customers can be mitigated by instituting sound risk-management steps. He recommends new exporters start by asking their customers to fill out the agency’s standard forms, a process that helps demystify credit extension. Having this information available is simply good business, he says. Ms. Axelrod applied for Ex-Im Bank’s small business export credit insurance, filled out her paperwork and got it. When she approached Wells Fargo Bank, the lender was willing to advance funds against the foreign receivables, providing a major boost to her cash flow. Now, “I borrow money based on my receivables,” she says. Since June, Ex-Im has opened three new regional export finance centers—in Minneapolis, Atlanta and Seattle. An office in Detroit is scheduled to open this fall. Hufbauer was in Seattle just before Labor Day to preside over the new center’s grand opening, taking the opportunity to declare that Ex-Im authorizes more financing to Washington than to any other state in the nation. What he said was correct, but what he left out was telling. The reason the Northwest state dominates the field is that the Boeing Corporation absorbs nearly all the state’s capital. Boeing, in fact, is far and away the largest recipient of Ex-Im financing in the country. Last year the aerospace giant received about 38 percent of the bank’s financial assistance, totaling $12.4 billion, including $700 million for Boeing Satellite Systems. The second-biggest recipient was General Electric, which received $1.2 billion. Most of this financing is in the form of direct loans or loan guarantees to overseas customers, such as Ethiopia, whose state airline took delivery of a Boeing 787 in August. Boeing received more than a third of the 115 loans and long-term guarantees the bank issued last year, according to an analysis by CNS news service. This positioning has angered a number of small-business advocates, who feel the company needs no public support to close its deals. Steven Dreyfus, who owns a small export management company in New York City, considers himself a fan of Ex-Im, and cares little about the political storm. Last year, after 20 years, his insurance company announced a rate hike his business could not absorb. With little to lose he reached out to Ex-Im; the agency stepped in and offered rates comparable to what he had earlier been paying. Couple of days ago, I read a comprehensive article in the Wall Street Journal titled “Trade Slows Around World” (see reprint below), which talked about slowing global economies and how declining exports dim U.S. economic recovery prospects. After reading this very sobering, fact filled, front page article, I couldn’t help but think that this is one of those defining moments that can either put our economy deeper into the proverbial hole, or force it to become more competitive and seize on the weaknesses of other global players who are also having trouble coping with the global economic slowdown. Our export machine, although vastly improved in the last three years, is working at a fraction of its capacity and efficiency. When he took office, President Obama called for the doubling of exports in 5 years, his one successful initiative I applaud and one that had a decent effect in real life. But in three years our nation’s export infrastructure has not been expanded, nor was it restructured to accommodate the increase and stimulate significant additional export transactions. Yes, a fair amount of work has been done in making exporters aware of the available financing and insurance programs. The signing of the Free Trade Agreements, increasing information dissemination on exporting basics, available transactions and reverse trade missions have not fundamentally changed the way buyers and sellers approach cross-border business. There is a tremendous disconnect between the understanding of foreign buyers as to what being bankable means in the eyes of American financial institutions and government agencies and the ability of our exporters, bankers and those same agencies to effectively bridge that gap to a greater degree then the current “low hanging fruit” transactions, which do get done, but represent a small portion of the potential deal flow. In our small firm we know of hundreds of millions of dollars in deals that could get done, but won’t because of this disconnect. Our colleagues know of billions more. At any given time I could recite 10-15 serious transactions which could easily become bankable if both sides were better prepared and underwriting standards were adjusted to be more reflective of the current business environment. 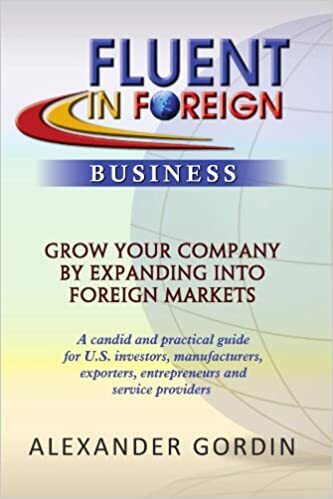 At our Firm, we found the problem to be so pervasive that we created an entire company – Fluent In Foreign Business™ (the Publisher of this blog), to help companies seeking to do business cross-border to bridge their knowledge gap, mitigate risks and enable effective business development activities. To us it is that serious and that important. We see massive untapped international business potential for the American small and midsize companies and we firmly believe that for our country to survive through these challenging global economic times, we need to seriously re-examine our current national exporting efforts. Now that we warmed up by raising awareness and increasing the exports under the President Obama’s National Export Initiative, we need to start working the subject by bringing in international business professionals to help the politicians, non-profits and educational institutions to address the 3Rs of export improvement: Redesign, Rebuild and Recharge the process of exports. One analogy I can make, as someone who can certainly stand to lose a few pounds himself, when an overweight couch potato decides to start walking and doing light exercise, it is certainly an improvement and some weight will come off. However, with this type of mild exertion it is light years for that couch potato to become a serious athlete. Yet, that is certainly possible with proper training, discipline and coaching. What we have done in the last three years in the export arena was to take a couch potato of a nation and introduce it to light exercise and rather than shedding a few pounds, we benefited by increasing exports. Nevertheless, we are still a huge distance from becoming a nation of serious athlete exporters. Below are couple of articles – one very recent and which details the issues we are facing now and one I wrote about a year ago, which offers comprehensive solutions and recommendations to what needs to be done for our country to shed the fat of bureaucracy, malaise of the cultural misunderstandings, fear of the unknown markets and lack of preparation to dig deeper in order to perform like the export champion nation we clearly could be. The trade shift could take a particularly big toll on the U.S. economy. Exports had been, until recently, “a stunningly strong driver of growth,” said Tom Porcelli, chief U.S. economist at RBC Capital Markets. Exports have accounted for almost half of U.S. growth during this recovery, compared with an average of 12% of growth in economic cycles over the past four decades, he said. Global growth has been slowing but financial markets have remained optimistic that politicians will come riding to the rescue. Now, though, hopes of political leadership are fading fast. Dow Jones’s Martin Essex reports. More U.S. companies may downgrade their global growth estimates in the coming weeks as they prepare to report earnings from the third quarter, which ended Sunday. FedEx Corp.FDX +1.03% and Caterpillar Inc.CAT -0.88% already have downgraded their global outlooks. The slowdown also could thwart the Obama administration goal of doubling U.S. exports in the five years following the end of the recession in 2009. President Barack Obama has held up the goal as key in his effort to boost U.S. manufacturing and create more jobs. 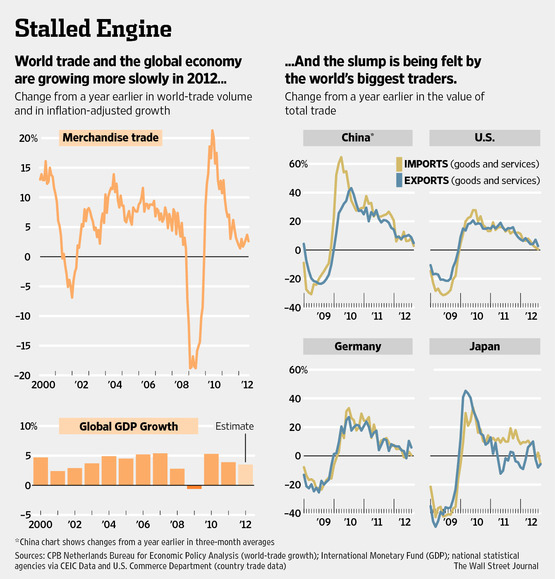 The trade slowdown could worsen as momentum slips across the global economy. The International Monetary Fund is lowering its forecast for global economic growth to just over 3% this year, according to projections to be released at its annual meeting in Tokyo next week. Europe is the epicenter of the weakness radiating through the global economy. Chinese exports to the European Union—until last year its largest export market—have fallen 5% so far this year through August. Weak exports have exacerbated a slowdown in China’s domestic economy, which economists project will grow around 7.5% this year, which would be the weakest annual expansion since 1990. China’s manufacturing sector contracted for the second straight month in September, the government reported Monday, underscoring the troubles in the world’s second-largest economy. A separate HSBC/Markit survey of China’s manufacturers released Saturday found orders for new exports in September hit a 42-month low. This slowdown is curbing exports to China from other Asian countries, such as Singapore and Thailand, which provide components for goods that end up in the hands of European consumers. Japanese exports to Europe also are tumbling. U.S. exports to the European Union fell in July after largely holding up for two years, while overall export growth slowed to a trickle this summer. The Port of Los Angeles, the nation’s largest, said the volume of loaded outbound containers fell 10.5% in August from a year earlier. U.S. manufacturers’ new export orders declined for three straight months through August, ending three straight years of expansion, according to a survey from the Institute for Supply Management. The purchasing managers’ group’s latest report, due out on Monday, is expected to show continued weakness. At Aquathin Corp., a Pompano Beach, Fla., manufacturer of water-purification systems, exports to the struggling nations in Europe are down “significantly,” said company President Alfred Lipshultz. The closely held company exports to three dozen countries, accounting for three-fourths of its business. Mr. Lipshultz said he didn’t expect a return to faster growth until at least 2014, but he noted other markets are still holding up despite Europe’s troubles. “It’s more uncomfortable than it is bad,” he said. While Europe is the main problem, demand also is slowing elsewhere. China is struggling to boost domestic demand while preventing broader economic damage from an overheated real-estate sector. The U.S. remains under strain as households cut debt and limit their spending, while concerns about U.S. budget policy hang over businesses. Japan’s sluggish economy is being weighed down by a climbing currency that makes its exports more expensive overseas. The latest slowdown could bury the theory, embraced by many investors in recent years, that big developing economies such as China and India could break from the trends of their advanced counterparts. “If you had decoupling, you’d have growth rates holding up in the emerging markets despite the decline in Europe,” said William Cline, a senior fellow at the Peterson Institute for International Economics.Global trade had grown an average of 6% a year over the past two decades, faster than the overall global economy, as globalization opened markets and led to integrated global supply chains.Outright declines in world trade volumes are rare. Apart from the severe 12% drop in 2009, total world trade declined only three other times in the past half century. Unlike 2009, when trade seized up globally, there are pockets of strength today. “We haven’t dropped a lot because what we lost in market share in Europe, in places like Spain and Portugal, we made up for in Latin America,” said Eddie Wong, deputy chief executive of Silverlit Toys. Silverlit employs around 4,000 workers in Dongguang, in China’s southern Guangdong province.Silverlit is set to make about five million remote-controlled helicopters this year, similar to last year’s volume, Mr. Wong said. He is counting on his latest helicopter model with a live web camera to boost sales and has only seen “some minor cancellations” in orders recently from European clients.The U.S. market has been a relative bright spot for China. Exports from China to the U.S. are up 10% so far this year. While that is slower than in past years, it is enough to make the U.S. China’s biggest export destination so far this year, beating out the EU for the first time since 2006. Still, at China’s biggest ports, volumes are falling. Shanghai, the world’s largest port by volume, saw a 6% decline in shipping containers passing its quays in August compared with the year earlier. “Exports continue to be a challenge,” said Ming Mei, chief executive of Global Logistic Properties, which owns warehouses in China and Japan. Similar pressures can be seen elsewhere in Asia. Sri Lanka had been experiencing strong export growth since the end of the civil war in 2009 and a shift of production away from China where wages are rising quickly. But now it appears the island nation’s apparel exports will drop this year, said A. Sukurman, head of Sri Lanka’s Joint Apparel Association Forum, a trade group, and owner of Star Garments Ltd., a supplier to brands such as Abercrombie & Fitch, Ann Taylor and Lands’ End. A version of this article appeared October 1, 2012, on page A1 in the U.S. edition of The Wall Street Journal, with the headline: Trade Slows Around World. Allegations of bribing overseas officials have already cost Avon Products Inc., Weatherford International Ltd. and Wal-Mart Stores Inc. nearly half a billion dollars. And they haven’t been charged. Under widespread practice, companies often spend millions of dollars investigating themselves for potential violations of the 1977 Foreign Corrupt Practices Act, then turn over the results to the government in the hope of getting lighter penalties or none at all. The combined $456 million spent by those three companies largely went to law firms and other professionals hired to conduct the probes and fortify the companies’ internal antibribery controls. The post-Watergate law has become big business for the lawyers who delve into the operations of companies in response to an investigation by the Justice Department and the Securities and Exchange Commission—or to avoid one. The result is a mini-industry of investigators and white-collar criminal-law practices. “It’s one of the few sort of crown-jewel practices right now,” said Dan Binstock, a Washington-based legal recruiter at Garrison & Sisson Inc. Some FCPA lawyers draw more than $1 million a year in compensation, while a select group commands more than $2 million. “Firms want to get the best attorneys and they’re willing to pay,” he said. The FCPA makes it illegal to offer money or a gift to foreign-government officials or employees to gain a business advantage. The law applies to any company listed on a U.S. stock exchange or based in the U.S.
FCPA probes have resulted in government settlements with several companies, Siemens AG having racked up the biggest so far—$800 million—for paying millions of dollars to foreign officials to win government contracts. More than a hundred other companies are under investigation, including News Corp., which publishes The Wall Street Journal. The Justice Department has requested information from the company about possible payments made by its U.K. tabloid newspapers to British policemen, people familiar with the matter have said. A News Corp. spokesman declined to comment. The Justice Department is preparing to issue as early as this week new guidelines on how to comply with the FCPA, after more than a year of lobbying by American corporations. 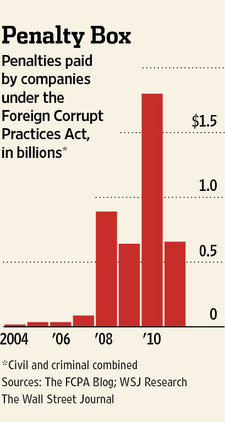 The U.S. is one of dozens of nations, including Russia and China, banning overseas bribery. But the U.S. has brought far more cases than anyone else. The Justice Department and the SEC have investigated companies in the developing as well the developed world. The U.S. government has also forged alliances with anticorruption authorities overseas, such as those in the U.K., to help speed investigations. Advocates for the FCPA say the process has led companies to tighten their controls over foreign subsidiaries, which has long-term benefits for their operations and the integrity of world commerce. Associated Press Assistant Attorney General Lanny Breuer. The cost and efforts of conducting internal investigations can seem like punishments themselves. In some cases, the criminal and civil settlements companies pay are dwarfed by their investigative expenses. “Even the most innocent gesture of kindness, like taking someone to lunch or cocktails, has to be looked at under the microscope of federal law,” said Kevin O’Connor, a consultant in New York who works with companies on anticorruption. The case of Siemens, a German conglomerate with more than 400,000 employees and operations in 191 countries, offers one of the best illustrations of how quickly costs pile up. The company in 2008 admitted to paying millions of dollars to foreign officials in Argentina, Bangladesh and elsewhere. Siemens hired more than 300 lawyers, forensic accountants and support staff from law firm Debevoise & Plimpton LLP and accounting firm Deloitte LLP for a two-year internal probe, settlement documents said. The company estimated that the firms racked up 1.5 million billable hours. The investigation spanned 34 countries and included 1,750 interviews. Of the roughly 100 million documents collected in the investigation, Siemens produced about 24,000 documents for the Justice Department. The document review alone cost the company $100 million. Law-enforcement officials said internal probes are necessary to police a big marketplace. “We absolutely need companies through their firms to provide us with their investigations,” said Lanny Breuer, the head of the Justice Department’s Criminal Division. Prosecutors test the information they receive from the companies and conduct parallel investigations. “We’re not simply relying on what the companies give us,” he said. Mr. Breuer said the Justice Department has paid special attention to operations in countries considered to be high risks for corruption. “We don’t just arbitrarily say, ‘Jump,’ ” he said. Nevertheless, companies have made the calculation that spending huge sums on an internal FCPA probe is better than being indicted or taking a case to trial. “When you get these situations and you have a young enforcement attorney…telling you to look under every rock, you do it,” said Amar D. Sarwal, chief legal strategist of the Association of Corporate Counsel, a trade group for in-house lawyers. That means law firms have built FCPA practices around former prosecutors and SEC lawyers. Avon, the door-to-door supplier of beauty products, is in the fifth year of an internal investigation into whether employees paid bribes overseas and has spent about $280 million on legal expenses, according to regulatory filings. The probe began in China in 2008 after a whistleblower told the chief executive that Avon employees were plying Chinese officials with meals, gifts and trips, according to regulatory filings. The company hired lawyer Claudius Sokenu, now at Arnold & Porter LLP, who quickly moved to preserve electronic and paper documents. Auditors in China picked through company accounting systems for evidence of bribes, while another contractor copied hard drives and created a searchable database, a person involved with the investigation said.Lawyers interviewed employees. Translators pored through documents. The company, which voluntarily disclosed its investigation to the Justice Department and the SEC in 2008, repeated the process in more than a dozen countries over the next four years, the person said. The company in August said it had begun settlement talks with the government. An Avon spokeswoman declined comment. Steven Tyrrell, former chief of the Justice Department’s criminal-fraud section, estimated that a multinational company spends, on average, about $2 million to investigate its operations in one country and that most investigations span several countries. Smaller investigations for a “specific, discrete issue,” can cost around $100,000 to $200,000, said Paul McNulty, a partner at Baker & McKenzie LLP. But companies have to be prepared to assure the government that a problem in one country doesn’t exist in others. Oil-services company Weatherford International has spent more than $125 million on a six-year probe into alleged export violations and bribes in Europe, Iraq and West Africa, according to regulatory filings. The Geneva-based company and the U.S. government have been negotiating a penalty for months but are tens of millions of dollars apart, a lawyer briefed on talks said. And in less than a year, Wal-Mart has put $51 million into a bribery probe of operations in Mexico and elsewhere, according to company filings. Wal-Mart declined to comment further. Drug maker Pfizer Inc. agreed this year to pay $60 million to settle bribery allegations, admitting to having bribed doctors, hospital administrators and regulators in several countries to prescribe medicines. Lawyers who conduct FCPA investigations say the company likely paid more than double the settlement amount in its seven-year investigation to build internal systems to prevent bribery. Pfizer declined to comment. —Christopher M. Matthews, Emily Glazer, Ashby Jones and Shelly Banjo contributed to this article. Save money. Give better. Walmart execs were investigated under FCPA rules, targeted for bribing Mexican politicos to the tune of $24 million. The New York Times broke the story this spring: “Vast Mexico Bribery Case Hushed Up by Walmart After Top-Level Struggle.” The world’s largest retailer, and Latin America’s biggest employer, stood accused of handing envelopes stuffed with cash—more than $24 million in total—to a small army of palms-out, provincial bureaucrats, local politicos and fixers. Senior executives covered the mess up, reported the Times. News of these activities, illegal in America under the Foreign Corrupt Practices Act (FCPA), proliferated globally and drained billions from the Arkansas retailer’s market capitalization. With sales of $422 billion last year, Walmart became the largest whale targeted by federal prosecutors in the FCPA’s history, joining a roster that includes Johnson & Johnson, Avon, Siemens, Olympus and Pfizer. It’s not just big companies. The feds pursued, prosecuted and last year jailed a husband-and-wife Hollywood couple who made improper payments in connection with a Thai film festival. The feds called the payments bribery and the charges stuck. Last year, Gerald and Patricia Green went to jail—she was 56, he 76 at the time of his sentencing, and dependent on an oxygen tank. The Greens served six months in prison, followed by house confinement. Prosecutors originally wanted to put Gerald Green away for life. To champions of the statute, the feds’ action in the Walmart case exemplifies what’s best in the law, at least theoretically. It levels the playing field and addresses the root causes of corruption, that is, the willingness of rich companies to pay illegal bribes, thus perpetuating inequity and lack of economic mobility. In this view, Washington is the “good cop,” punishing those who cheat and defending those who play fair. As a growing number of companies and individuals face criminal and civil penalties, awareness of the statute is rising, along with concern over its expanding footprint. Those certain of their ability to distinguish between a friendly gift to a business partner and an under-the-table bribe to a corrupt official might want to think again. In any case, they should take pains to avoid learning the difference during a Justice Department probe. If one thing is clear, it’s this: Most of the “gray areas” that involve gift giving, special fees, favors, undisclosed payments or cash on the barrel head—any number of activities once defended as “business as usual,” “everybody does it” or “it’s customary here”—are remarkably difficult to pin down. And as far as definitive government guidance in terms of what’s legal versus what’s not, that advice is not yet available. The FCPA dates from a period in our history—the post-Watergate years—when the national mood was one of outrage at government dishonesty and systematic deception, accompanied by the particularly American belief that somehow honesty could be legislated and integrity codified. This mood prevailed in 1977 when President Jimmy Carter signed the Foreign Corrupt Practices Act into law. Simple in scope but startling in premise, the FCPA outlawed both the act of bribing a foreign official for commercial advantage, and the failure to put in place a system to prevent, reveal or thwart corrupt activity. In an attempt to legislate honesty and fairness, Washington had suddenly made American business people legally responsible for knowing the history and intentions of other individuals, specifically citizens of other countries, without ready access to such information or legal recourse. Established at a time when some foreign countries actually let companies expense their bribes—so entrenched into custom was the culture of gift-giving—the act seemed designed to claim the moral high ground for a country still climbing out of the moral morass of Watergate. As such, this claim to ethical leadership in the global market must have struck at least some observers as a pipe dream. Early on, enforcement was lax. Investigators probed just several companies during the statute’s first full year on the books, maintaining that unhurried pace over two decades. Then came the string of white collar frauds—Enron, Worldcom, Computer Associates—and battling corruption was back in vogue. Mark Brzezinksi, a partner at McGuireWoods law firm in Washington, recalls Justice operating perhaps 10 probes in 2000. That number ballooned to more than 150 in 2010. Meanwhile, the SEC was investigating another 20 or so firms. Accounts suggest that level of activity continues today. The escalation of FCPA enforcement troubles a number of export advocates. One is the U.S. Chamber of Commerce, which has questioned the act’s basic fairness and its impact on trade. In February, the chamber’s legal reform division pressed Justice and SEC officials to address questions concerning prosecutorial standards, compliance expectations and training guidelines. In particular, the chamber sought clarification on what’s known as mens rea, a legal term referring to how prosecutors reconstruct an individual’s thinking process at a key moment. The feds’ answer was, in effect, we’ll get back to you. Homer Moyer, a partner with Miller & Chevalier law firm based in the capital, specializes in international anti-corruption law. Despite the rise in enforcement activity and penalties assessed, Moyer contends prosecutors are not necessarily pursuing corruption cases more aggressively, rather keeping up with the flow. In his view, more business is being done in regions where bribery is rampant; financial reporting requirements heightened under Sarbanes-Oxley, Dodd-Frank and other laws expose considerably more corruption; disgruntled employees trust whistle blower laws will protect them if they turn evidence; and competitors strike back at rivals who played an unfair card. Moyer, who has served as an independent compliance consultant to the SEC and chaired more than 30 national and international anti-corruption conferences, acknowledges investigations come in batches. Probing a company in one industry, he says, tends to produce evidence incriminating others in the field. Not surprisingly, prosecutors have focused on activities in parts of the world where corruption is perceived as most rampant and where official approvals are required for a broad swath of activities handled without officials’ interference in more open countries. Also, industrializing countries actively seeking western technology transfers, sales of capital equipment, financial savvy or hard-currency funding, and as such are perceived as the most fertile grounds for corruption. “If I am focused on Northern Europe, and doing business in both Denmark and Russia, I will recognize that Russia carries a much higher risk of corruption than Denmark,” says Moyer. Logan Robinson, who teaches corporate governance at the Mercy School of Law in Detroit, contends there is increasing federal scrutiny of potentially illegal overseas activities. “We are seeing much more aggressive enforcement, and much more in the way of fines, than occurred initially [in the 1970s],” he says. What’s a Bribe, What’s Not? Those looking for clear direction in bribery avoidance will be disappointed. Ambiguity, ambivalence and shades of gray prevail. In general, beware of requests for payments that are not automatically assessed to your competitors, and try to deflect requests for non-cash compensation that involves family members. And keep the clearest possible line drawn between business and pleasure. As your business expands overseas, be sure to follow these tips to avoid the long arm of the law. “An official might ask you casually about a job or internship for a son or daughter,” notes Alexandra Wrage, president of Trace International, a best-practices compliance firm in Annapolis, Maryland. Similarly, scheduling a week-long meeting in Las Vegas around a day of business meetings courts trouble—was this a real business meeting, the feds might ask, or a gifted week at a resort? Wrage warns exporters not to obsess over deals with top officials and overlook possible concerns with distributors, licensees, consultants and customers. At the same time, recognize the law treats an official’s close family members as if they, too, are officials. Under the FCPA, everyone who works for a government—say an air steward employed on a state airline—is an official. Learning who’s related to whom, and how they do business, becomes your legal responsibility. Ask questions; if your potential partner clams up, or speaks misleadingly, reconsider your relationship. Good advice for exporters: Check up on the person you’re dealing with, ask for financial records, know their reputation and history, record your investigation and closely monitor expenses and payments. Also, reimburse no one without a detailed expense report. Some compliance advisors suggest going further. “Get a signed affidavit that says the party has done nothing that would violate either the Foreign Corrupt Practice Act or any local corruption laws,” advises Trip Mackintosh, chairman of the export controls department of Denver law firm Holland & Hart. Alexander Gordin, a Manhattan-based investment banker and Ukraine-born trade consultant, warns exporters to scrutinize invoices, deal terms, contracts and correspondence for evidence of the kind of subtle corruption pervasive in many emerging markets. Are expenses higher than they might have been under similar circumstances, for example, but your distributor won’t explain why? Are you’re getting invoices without cost breakdowns? These could be close-to-the-vest business practices, or evidence to the feds you’re practicing international skullduggery. Ministers in a capital city are, obviously, officials. So may be the farmer who runs a provincial post office part time. So may be the pilot of a government-owned airplane, the moonlighting professor at a public university and the hospital physician whose family business distributes medical equipment. Rule of thumb: Anyone on a government payroll is an official. You can pay a fee to an official to accelerate a service—for example, to guarantee completing your permit process within seven days. However, you cannot pay a fee to get a permit to sell something prohibited, or to occupy a location ruled off limits. Size of gray area: Vast. Rule of thumb: Avoid paying “upgrade” fees. Ignorance of criminal behavior on the part of your partners is an acceptable defense—sometimes. Prosecutors will want to know if you took every possible step to learn your partners’ background before you signed any contracts with them, and that you made real attempts to monitor their activities once they signed with you. Rule of thumb: Require affidavit attesting to partner’s clean history and knowledge of and commitment to FCPA compliance. 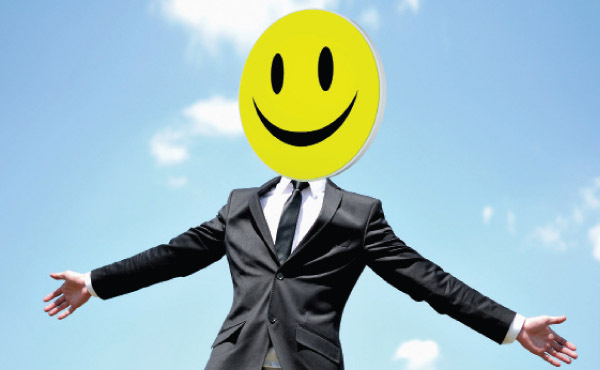 Have you trained your employees to recognize unethical or illegal behavior? Do you have anti-corruption compliance programs in place? Protection for whistleblowers? An invoice template that specifies each reimbursement? Rule of thumb: Purchase a FCPA compliance module, or contract a consultant to create one for you. On August 7, Pfizer became the lates company to settle charges of conspiracy and violations of the Foreign Corrupt Practices Act, stemming from its Wyeth subsidiary’s business activities in Russia, Croatia, Kazakhstan and Bulgaria. 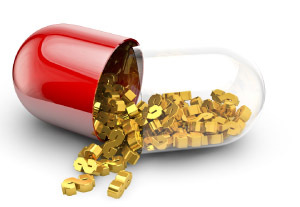 The drug company agreed to pay a $15 million Justice Department penalty and more than $26.3 million to the Securities and Exchange Commission to disgorge profits it earned in these countries. “Those that attempt to make these illegal back-room deals to influence contract procurement can expect to be investigated by the FBI and appropriately held responsible for their actions,” thundered James McJunkin, assistant director in charge of the FBI’s Washington Field Office, in a statement.